Yom Kippur is the Super Bowl Sunday of Jewish Holidays - even people who aren't regulars or aren't affiliated in any way come to services on Yom Kippur. Which is probably the worst idea - their one exposure to Judaism is a day of fasting, boring prayer, no sexual activity, and more boring prayer. No wonder they don't come back for a whole year. So how can one use this opportunity to give people an interesting and meaningful experience, something that might inspire them to come back again or to explore more about this thing in their life called Judaism? 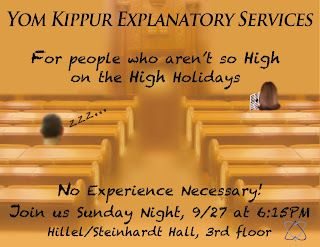 We decided that we would run explanatory services for Yom Kippur night. They would be the same, traditional services that we all know and love, but with explanations - not just the meaning of the words, but why we say them, what intentions then connote and how they're relevant to our personal lives. With help from Joan and Michael G. (and NJOP's slogan) we made these really cool palm cards. Thanks to Matt, ArielF, and others, we gave out nearly 500 of them on Locust Walk during the week leading up to YK. Of course, Hillel neglected to include us on their banner/informational flyers listing all the services, so we had to do all the advertising ourselves. Then Danny and I set to work planning out what we would say, how we would lead the services, and how it would actually happen. It took a bit of work, reading, thinking, talking with R' Lynn, and discussing, but after much planning, we were ready. I asked some people from the OCP to come - to lend their voices, to be another body, and to be a friendly and helping face for the unfamiliar people who came. Understandably, many turned down the offer - "Hart, this sounds great. But it's Yom Kippur, I can't give up my own Yom Kippur davening for this". And so, Yom Kippur night, as everyone headed to their respective services, I headed to the 3rd floor of Hillel/Steinhardt Hall. We had piles of transliterated interlinear machzorim, piles of kippot, and sheets of reading materials. And people began to come. Some were OCP people who volunteered to help out or who wanted to experience it themselves. Some were people I had recently had over at one of my Shabbat dinners. And some were strangers, people I'd never, or barely ever seen before. By the end, there were over 50 people (although surprisingly many more guys than girls - anyone wanna venture a guess why?). We started by breaking into discussion groups, setting a comfortable stage before filing back into seats for the actual prayers. And as I started leading Kol Nidre, I couldn't help but notice the request we sing 3 times right before we start "אני מתירים להתפלל עם העברינים" - "we grant permission to pray with the sinners". What? Before the holiest of days we take a moment to welcome in all pray-ers, even the sinners among us? In some ways, it addresses all of us for we all have sinned, or as some translators prefer, we are all ephemeral. But the liturgy clearly does go out of its way, basing itself on a gemara which says that any public day of fasting and prayer that doesn't include the full gamut of practitioners of Judaism, doesn't count. Why? Because as we approach God on the day of Judgment and we work to rebuild our commitment and intimacy with Him, we are coming as part of God's people. And God's people includes all of His people, not just you or the people you like, but all who are part of our family, whether they play the part or not. And for God to show His love for us, should not we first show our love for our fellow brethren (and that doesn't just mean our roommates or siblings with whom we've fought). And so, especially on the Holiest day, we come to God with everything we got, and specifically call out and invite in those who might not have been in synagogue in a year. With that spirit in mind, we went into the prayers. There were some meditations, some group singing, some role-playing, and some good old praying. At the end, people came up to us and told us this was their most meaningful davening in recent memory, or in their 4 years at Penn, or in their life. One person, whom we had hold the Torah for Kol Nidre, said with tears practically in his eyes that this was the first time he touched a Torah since his Bar mitzvah - and it meant the world to him. And the Orthodox people also came up to me and told me this was the most beautiful and inspiring davening they had ever been at. I can take only minimal credit for this, as it was Danny's wonderful, uplifting, and beautiful words which helped lead everyone to a relevant and explained davening.